Welcome to this stop on the Return to Exile blog tour. Click on the tour above to visit the other participating blogs for giveaways (like bracelets, books, critiques), reviews, and interviews. Awesome information, recipes, & prize pack ahead! A WHOLE WORLD TO SAVE. Featuring an action-packed plot that covers the gamut of every monster you've never heard of (not to mention weird powers and weapons made out of garbage), Return to Exile--a modern-day fantasy adventure set in our world--is brimming with boy and girl appeal and is a gem for reluctant young readers. And, with a diverse assortment of well-aged monster hunters in the cast, this series will be a hit with adults young and old, as well. * Read the 1st 103 pgs + the Hunter's Journal! * Visit the uber cool Return to Exile website! What's up with the goulash? I love that the book is a goulash sandwich. I mean, goulash sandwiches the story like a meaty, vegetably, brothy Oreo (does it really taste that bad??) with a dark, creamy center. Return to Exile begins and ends with goulash. So how did goulash work its way into the story? It's pretty much its own character. When I was growing up, my mom used to take whatever was in the house and throw it together in a pan to make goulash. I hated it. We were poor, so what usually ended up in the goulash were things like potatoes or macaroni, canned tomatoes, canned corn, canned beans, various other canned vegetables, maybe some hamburger, leftovers from previous meals, and whatever else was around, and then my mom would call it goulash and we'd eat it for days. I'm sure I'm remembering it as worse than it actually was--I hated just about all food when I was young, and I'm impressed my parents were able to keep me alive at all--but the horror of goulash has lingered with me over the years, so when I needed a gross food for the book, it was a natural choice. You're the first one who's noticed (or at least mentioned) the goulash sandwich. It ties together Sky's emotional arc in the same way the Quadruple Quandary ties together the plot arc, (***spoiler alert! ***) and the lone pocket watch Phineas gives Sky--connected to the monocles in the end to form a "band of one"--ties together the thematic arc. You can make your own goulash by following this recipe here from Smitten Kitchen. 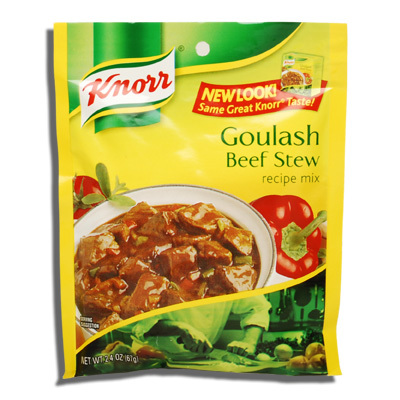 OR if you win this awesome sauce (and other things) giveaway, you can make it the Knorr way, with the Knorr Goulash Beef Stew mix! And Phineas loves pie. Particularly meat pies, correct? And yes, Phineas loves all pies, but meat pies are his favorite. At one point, I had a scene in The Legend Thief that talked about his obsession with lemon cakes, but I ended up cutting it in one of the rewrites. It's too bad; it was a funny bit, but it just didn't fit anymore. You all know I like food. Or if you didn't, I do. Hence the "Yummy Monday" posts. I will double check with Eric, but perhaps when The Legend Thief (The Hunter Chronicles, snare 2) comes out this December, I'll post that deleted lemon cakes scene. How does that sound? Delicious? I don't think I've mentioned this anywhere before, and I've only had one person notice, but Phineas is actually a Christ figure. The book takes place over three days, Phineas is lost in the belly of the Jack after giving his life to save the monster hunters, and he "rises again" in the epilogue. There are many other allusions to this hidden throughout the book, but the most obvious reference occurs when Phineas is fighting the Jack: “Phineas stood for a moment, pressing against the weight of the world, his body torn and broken…his side spilling terrible blood.” I wrote that scene imagining Christ in the Garden of Gethsemane, with the Jack playing the role of the sins of the world. That's why it's my favorite scene. So, as you learned farther above, one of the items in the Return to Exile giveaway pack is a packet of goulash stew mix. But wait, there's more. Sky Weathers is a clever puzzler. In Return to Exile he has a Rubik's Cube, but chances are you, or whomever you may give this prize pack to if you win, has a Rubik's Cube too. But you (or they) probably don't have a Gordian's Knot. I think Sky would love this (and most likely solve it in a matter of minutes *sigh*). 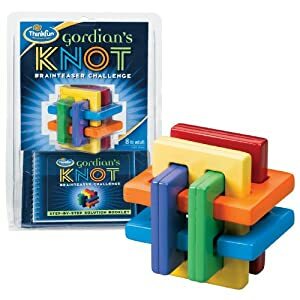 The Gordian's Knot puzzle toy is inspired by an ancient Greek legend of the special knot. Click here to learn the history of this famous knot. AND, what Return to Exile prize pack would be complete without a book of knots? Sky's uncle Phineas taught him a ton of different knots, many of which he caught Sky with, and vise-versa. Hey! You've got to learn somehow. But the Klutz company has made it easier for us (though nothing is a substitute for practical application, right Uncle Phineas?) 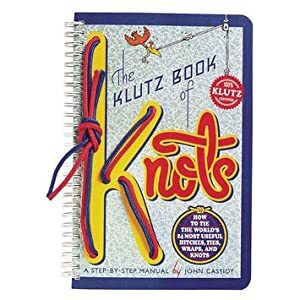 in the Klutz book of Knots. You can learn and practice 24 different kinds! Also included in the prize pack is a handmade (by me!) 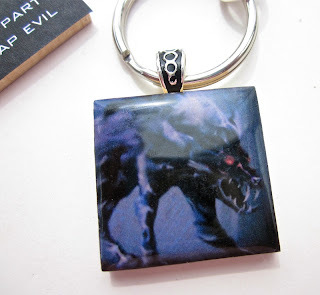 Return to Exile key chain featuring a Shadow Warg, one of the prevalent monsters in the story. To learn more about this monster, click here. This particular image is a portion of an illustration done by Provo, UT artist Jeff Brimley, a friend of author Eric Patten. To see the other monster illustration Jeff did from Return to Exile, click here. What else will you get in this amazing Return to Exile giveaway pack? 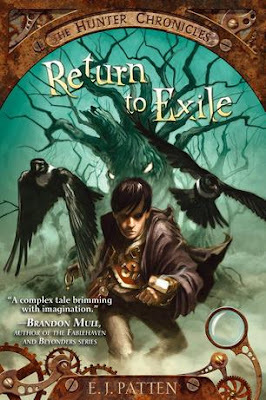 A cool Return to Exile bookmark featuring book 1 on the front and book 2, The Legend Thief coming December 4th, on the back, as well as a bookplate autographed by Eric Patten to stick in your copy of Return to Exile! Is this not the best prize pack ever? Use the Rafflecopter form below to enter. 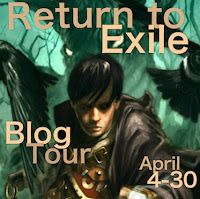 And don't forget to visit the other stops on the Return to Exile blog tour! I absolutely HATE green beans but my parents always insisted I try again to eat them. It never worked out well. Steak. I couldn't stand it. But I love it now. I HATED (and still hate) broccoli. The sight and smell absolutely disgusts me. That and cauliflower. Both are so bland looking, but they taste awful!